Elijah achieved a great victory on Mount Carmel when he defeated the prophets of Baal. Then along came Queen Jezebel who threatened his life, and suddenly this great man of God took to his heels and fled. He seemed to fall apart. Everything was too much. After running for many miles, he fell to the ground, exhausted and disheartened, and prayed for the Lord to take his life. Then he fell asleep. God allowed the man to rest a while, then sent an angel to give him a warm meal. “Arise and eat, for the journey is too much for you.” the angel urged Elijah. There were many times during my double stint of chemotherapy when I felt like Elijah. Exhausted and disheartened I would flop on my bed and think, Is it really worth the struggle? Then I would remember my family and all the incomplete projects in my life, and I knew I couldn’t give up. At times like this, I made a point of being honest with God. He already knew how I felt, so why pretend? I always knew that He hadn’t sent the cancer in the first place, but I often expected Him to intervene a lot quicker when the ghastly side-effects kicked in. The answer came, usually not in the miraculous way I wanted but by my inability to do anything but lie down and close my eyes. God never took his eyes off me. He knew what I needed far better than any doctor. Right then, he wanted me to rest. He prompted my husband and friends to provide me with nourishing food. He knew that the journey was too much for me, and that I needed to allow my body to do what it did best: build itself up. * Is life getting you down? * Are you exhausted, or disheartened? * Do you sometimes wish you had the courage to end your life? The Lord understands. He doesn’t expect you to push yourself beyond your endurance level. Tell Him how you feel. Then allow yourself to rest. Nourish your body with healthy snacks or drinks. And allow healing to come as God strengthens you for the next step in your journey to the future. Lord, you know where I am right now. Show me how to care for my body and mind. Help me to get past this hurdle. Lift my spirits Lord, please. Amen. One of the strangest gifts I received following my surgery for breast cancer came from my son Stephen. It was a small bean-bag lion, with a notable squint and a crooked nose. Below are the words of a letter sent to me from a courageous and dear friend, Cheryl Kroch. 2 December 2007 Last night when I was in bed I was thinking about all the things I had been through this last year. There in the darkened room, I sensed the Lord speak to me through the words of Jeremiah 29:11: ‘I know the plans I have for you, plans to prosper you and not to harm you!” I saw my year of treatment in a new way. Cancer is a disease. Satan had to ask God’s permission to test Job before he was allowed to send him trials. In the same way, before Satan could inflict me with cancer, he had to ask God. The Lord showed me that it was all part of His plan because He wanted to prosper me and not harm me. The cancer was supposed to hurt me, maybe even destroy me but God knew me better. He knew I would use it to glorify Him at every opportunity. He knew I would call on Him when I was in deep distress. He had every person He knew I would need in place and waiting for me to call on them, like you Shirl, E__, D__, G__ and other friends and family. But most important of all He had His Son, my Lord Jesus, waiting to help me because He had already been ahead of me along the path of suffering. Every word of encouragement from the mouths of my friends and family was in perfect symphony with the soft words of encouragement from Jesus. In every hug there were always two sets of arms, the person hugging me and my Lord’s. Every kind deed was accompanied with His perfect touch. And when I felt that I couldn’t carry on, He took over and literally carried me. I sensed a thrill move through my body. I have been prospered! I am so much richer for all I went through this last year. I always understood this verse of Scripture to mean wealth in financial and material means but I now realised that God meant it for so much more… spiritual, emotional, physical, mental… the list is endless. I have grown so much this last year spiritually. I am more confident in myself. My love for the Lord has deepened beyond even my own comprehension. I know there are many cancer sufferers who haven’t discovered the pure joy of knowing God in their midst, eager to help them through the “valley of the shadow of death”. I long for them to know that His “rod and staff shall protect” them from “all evil” and all harm much like He has done for me, for D__ and for you. Even though D__ has gone on to be with the Lord, I now know she triumphed over death. She was prosperous and she was never harmed. The Lord made very sure of that because she belonged to Him. D__ touched many people. She used to take devotional booklets with her to treatment and leave them in the Chemo room for others to read. That was just one way she tried to share God’s love with other sufferers. She always laughed and smiled. She had a joy that drew people to chat to her. While she was receiving treatment she would talk about how good God was to her. She shared this with me. And in this way God’s plans saw her prosper. 10 months after this email, on 17th October 2008, God did indeed take Cheryl home. Now she really knows the meaning of the word “prosper”! She’s living where even the streets are paved with gold. Scripture has made clear the incredible thought that each of us was in the mind of God—before we were born. That is why I believe I was. I also believe He had/has a plan for each person born and, in fact, allowed and gave life to each one of us. So great is His LOVE to us. You chose my way, for I was in Your Plan! And with your Love, You set my spirit free! Yet this I know, that I was in Your Plan! He lived a man, and brought me victory. Oh, Praise His Name! This Shepherd lives for-ever! Though wayward sheep, yet we are in His Plan! It will be then–we’ll understand His Plan. Twas Calvary where all Thy love was shown. Has proved to me, that I was in His plan. As a nursing sister I was often present when people received this news. I believed, as so many do, that this meant probable surgery, radiotherapy, chemotherapy – but ultimately, the person would die. Fortunately, until this moment, these words were always addressed to someone else. Suddenly I felt indignant. How dare this intruder come into my life? I was not ready to die. I determined to fight. I refused to accept the sentence which had just been handed down to me. I would go through surgery, face the rigours of Radiotherapy, survive the horrors of Chemotherapy, but I would not die! It was months later that I remembered, I was in fact living under a death sentence. I had been all along. I was going to die. But it was not cancer that gave me this judgment. The moment I started to live, at conception, I received a limited set of days. The only sure thing about life is death. How true. My life came with an expiry date. No one but God knows the date, and cancer does not change it. Well, I guess it all depends on how you see death. If you see death as being stashed into a wooden box and lowered into the ground, and buried forever – that’s terrifying. If you see death as being put into a fire and burned to ashes to be sprinkled on some plot of land, or into the sea – it’s horrifying. If you see death as the end of everything, the time when life ends with no tomorrow – how pointless. If you see death as a state of limbo, where you experience nothing but ‘nothingness’ – how ghastly . . . and ghostly. If you see death as an opportunity to leave behind the life that you have lived, and return as somebody – or worse, something else – how absolutely dreadful. Over two thousand years ago another man was ‘born to die’. But this man was the Son of God. “God so loved the world” . . . hey, that’s all of us . . . “so much that He sent His only Son,” Jesus, “that whosoever” . . . that’s me, and you . . . “believes in Him would have eternal life.” Eternal life – not death. If you see death as not the end, but simply a doorway along life’s road – an opportunity to step into a better life, then how wonderful. How amazing. Through the long recuperation period, I came to see that cancer was actually a gift to me. Oh I have to be honest. It was a gift I didn’t want and I didn’t appreciate. I would have liked to give it straight back. And yet, it was a gift. Cancer taught me so much. It reminded me my own mortality, that I was indeed born with a death sentence. The reality of the disease prompted me to re-assess my life. I am only going to be here on earth for a short time. Not because of cancer, but because I was born. If you are consuming oxygen on this earth (and by virtue of the fact that you are reading this, I am presuming you are) you are going to die one day. Maybe not of cancer, maybe not young, but you will not live on this earth forever. So what does death mean to you? That made me think. Which would I rather do? Die of cancer? Or die in a car accident? Well, to be honest, I would rather not die at all. I would prefer to slip into a whole new way of life; one without pain and suffering, one without sadness and tears, one where I could be at peace forever. And that is exactly what I plan to do. Unfortunately, I haven’t worked out the physical details. This decision is in higher hands than mine. But my prayer is that when the time comes I will have the strength and courage to take that step, from one life to the next, with joy and anticipation. How about you? Have you come to terms with your own mortality? Will you still die physically? Of course. But you will step from one life into another – where there will be no physical or emotional suffering. Have you decided to ignore this offer of eternal life? Are you really brave enough to face your death sentence, not knowing what will happen at the end of your life? Do you choose to continue living under a death sentence? Or do you choose life? Footnote: If you have prayed this prayer, please drop me a line and let me know, so that I can pray for you. “Nothing . . . in all creation, will be able to separate us from the love of God that is in Christ Jesus our Lord” Romans 8:38. Lying in an isolation room of a busy hospital, I felt abandoned by my family, my friends, and even by God. I had been hospitalized in an emergency and had nothing with me, not even pajamas. I felt afraid. Why couldn’t I feel God’s presence? I spotted a Bible and flipped it open to Psalm 22. Hundreds of years later, from the cross, Jesus, God’s own Son, echoed those words. (Matt. 27:46, NIV). David and Jesus both felt abandoned by God, so I guess it is OK for me to feel the same way. It is not a sin to feel depressed; nor is it a sin to feel abandoned, even by God. But God did not fail David or Jesus, and God will not fail us. PRAY WITH ME: Dear God, when we feel alone and abandoned, thank you for the assurance that nothing can separate me from your love. Amen. JUST THINK: Feelings may change, but God’s love for us is changeless. We hear it all the time: “Lose weight for your health.” Unfortunately, the words tend to wash over your heads. How often have you joked, “My diet starts tomorrow”? In January 2003, the Journal of the American Medical Association featured a study finding that obesity appears to lessen life expectancy, especially among young adults. The researchers compared Body-Mass Index (BMI) to longevity and found a correlation between premature death and higher BMIs. For example, a 20-year-old white male of 5’10” who weighs 288 pounds and has a BMI of greater than 40 was estimated to lose 13 years of his life as a result of obesity. Jamie McManus, M.D., F.A.A.F.P. and author of “Your Personal Guide to Wellness” notes that while this study referenced extreme levels of obesity, there are still millions of overweight people in developed countries with a life expectancy rate that is three to five years less than their healthy-weight counterparts. She also estimates that there are 600,000 obesity-related deaths each year in America alone. How does obesity shorten our lifespan? This is a complex issue, but there is a clear link between obesity and the development of cancer. An extensive study conducted by the American Cancer Institute involving 750,000 people showed that obesity significantly increased the risk of cancer developing in the breast, colon, ovaries, uterus, pancreas, kidneys and gallbladder. Fat centered around the abdomen may also increase insulin in the blood, which also increases the risk of cancer. There is evidence that cancer rates in developed countries are increasing at 5 to 15 times faster than in still-developing countries. A major contributor to this alarming reality has proven to be diet. In populations where the diet consists mostly of fresh fruit and vegetables and whole grains, in contrast to the typical Western diet of fatty meats, refined flours, oils and sugars, the risk of cancer is much lower. The interaction of diet and the development of cancer is an active field of research. Dr David Heber, M.D., Ph.D. and author of “What Color is Your Diet,” says “It appears that diet has its most significant effects after the cancer has already formed, acting to inhibit or stimulate the growth of that cancer”. The typical Western diet leads to obesity and may actually encourage the growth of cancer cells. What if you now realise your eating habits are all wrong? Or perhaps your children are eating badly? It is never too late to improve the situation. Adopt a more healthy lifestyle and improve your eating habits, and you will see an improvement to your health and energy levels, as well as improving your chances of preventing cancer. Don’t wait until you’re diagnosed with cancer. Pre-cancer is the best time to fight the disease. As an RN with much paediatric experience I have a personal hangup about the diet of modern children in our “civilised society”. This is worth an article on its own, but the information that follows also applies to children. Then divide your weight by this figure. If you calculated in pounds and inches, you need to then multiply your answer by 173. If you used metric measurements, you don’t need to do this. The answer you have is your BMI. If you need illustrations to go with the instructions, see this site. 2. Match your diet to your body’s requirements. If you eat and drinkmake recipes leaner, and avoid buying food from fast food restaurants. Also learn how to snack with healthy choices. 3. Color your diet. Generally speaking the more colorful the fruit or vegetable, the better it is for you. Fill your plate with 5-9 healthy, cancer-fighting fruit and vegetables throughout the day. 4. Eat lean protein–if possible with every meal. Protein tells your brain that it’s full, and thus helps to control your hunger with less calories, while still maintaining a healthy muscle mass. Good choices of protein are soy shakes with fruit, the white meat of poultry, seafood such as shrimps, prawns, scallops and lobsters and ocean fish. Vegetarians may prefer soy based meat substitutes. 5. Rev up your metabolism with activity. Colleen Doyle, MS, RD, director of nutrition and physical activity for the American Cancer Society (ACS), says adults should do something active for at least 30 minutes every day. This doesn’t need to be gymnastics! Even a brisk walk will do the trick. Children should be active for at least an hour every day. 6. Get support in your new healthy eating plan. If you have a serious weight problem, it is likely you have developed habits concerning your daily food. People trying to lose weight do well to have the support of weight loss coaching, or even joining a weight-loss program such as Weigh-Less, or Weight Watchers. Next to smoking, obesity has been identified as the most preventable major risk to developing cancer. Even small weight losses can make a difference. It’s never too late to start. Nor can you ever be too young or too old to be concerned about your health and do something about achieving a more healthy weight. So before you move from this page, go back to #1 and measure your BMI. Then if you’re brave enough, post it below, together with your next step in fighting cancer. Nothing can sap a person’s strength and hope quite like a cancer diagnosis–unless it is the energy-stealing chemotherapy and surgeries faced in the fight against cancer. But one can find hope and strength in the pages of Scripture and in the experience of someone who has been there. 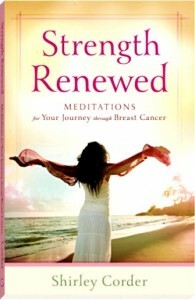 Strength Renewed is an encouraging daily devotional for those living in the valley of cancer. Meditations combine Scripture and stories from the author’s own experience. They can be read in sequential order to move the reader through a typical cancer journey from diagnosis through treatment. Each devotion also stands on its own, so readers can go directly to the entry that speaks to their need. Each meditation concludes with a short prayer and a Scripture verse for encouragement. Available wherever good books are sold, in print format or in all the e-reader formats. You can preview the first chapters of this book, or purchase it direct from this page. Click on the relevant tabs below the image. If you enjoy the book, I’d love it if you’d leave a book review on Amazon, Goodreads, or anywhere that stocks the book. Thank you!